Latinologues is a groundbreaking, comedic showcase created-written-directed for stage by award-winning writer/ performer Rick Najera. Originating more than 16 years ago, Latinologues is the longest running and only showcase of its kind in America, with a rotating cast of more than 150 actors. This critically-acclaimed show made its Broadway debut at the legendary Helen Hayes Theatre in New York in 2005, paving the way for other Latino shows to follow such as 'In the Heights'. 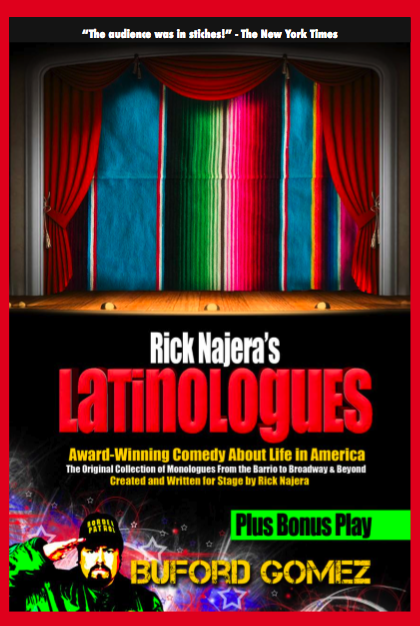 Rick Najera's Latinologues continues to pave the way for Latinos in America through social satire and comedy, one monologue at a time. Hot Off the Press! Latinologues the BOOK Now Available! Latinologues to play Covina Center for Performing Arts!